Jessica Meyer’s talk at Leeds last week was about the Friends Ambulance Unit. She mentioned that, especially later in the War, the main work of the Unit was on the ambulance trains that took the wounded from the war zone to the channel ports. This reminded me of a striking section in Ian MacKillop’s excellent biography of F. R. Leavis, who joined the FAU in 1915, and worked mostly on Ambulance Train 5, which went from the Somme to Boulogne. I couldn’t be a pacifist (that word came in then); I knew that the Germans mustn’t be allowed to win. But… I worried about the ‘ought’; the problem was insoluble. I joined the Friends Ambulance Unit. Stinking blankets and lice, and always a job to do that was too much for me. I used to carry cocoa along the roofs of French trains to men who would have died without it. The trains had overhead wires, and it was very easy to get your head caught. Don’t ever try it – it’s an art. 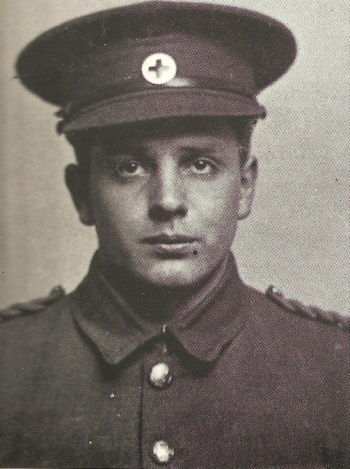 After demobilisation in 1919, Leavis was reticent about his war service, preferring not to talk about it. And Brooke’s ‘complexity’ amounts to little more than an inhibiting adolescent self-consciousness in an ironical disguise. Blunden (‘significant enough to show up the crowd of Georgian pastoralists’) and Edward Thomas (‘an original poet of rare quality, who has been associated with the Georgians by mischance’) are given their due, and (as those quotations indicate) used to contrast with the bulk of their generation. Wilfred Owen ‘was really a remarkable poet, and his verse is technically interesting. His reputation is becoming well established.’ This is praise, but I don’t think Leavis ever wrote criticism that engaged more fully with what Owen was doing. That tribute was reserved for Isaac Rosenberg, perhaps because he was less well-known. Together with another Scrutiny critic, D. W. Harding, Leavis did much to establish Rosenberg’s reputation in the 1930s. Apparently some students and colleagues attributed Leavis’s later intransigence and prickliness to his war experience. Maybe, but I think he was more complicated than that. This entry was written by George Simmers and posted on May 3, 2013 at 3:44 pm and filed under History, Military, Poetry. Bookmark the permalink. Follow any comments here with the RSS feed for this post. Post a comment or leave a trackback: Trackback URL.